Why schlep yourself over to the local bricks and mortar store when you can choose the litter box you need online? Sit at the comfort of your home, weigh the pros and cons of each model and then order the best litter pan for Kitty right off the Internet! 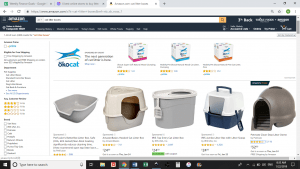 By far one of the best places to buy litter boxes online is Amazon. One of the advantages to buying products on Amazon is their review system that lets you see exactly what other buyers thought of an item before purchasing it. With litter boxes sourced from around the globe, it should be no surprise that Amazon has unmatched variety when it comes to litter boxes. Because they also have numerous sellers, you may also get a good deal as sellers compete to have the best price. For price, variety, and options, Amazon is a great place to find litter boxes. As you probably already guessed by their name, this website primarily offers medications for pets. Even so, they also have a number of other pet products available for sale. These are often discounted and you can save money when buying a litter box along with other needed pet supplies. Their selection of litter boxes is small, but it’s still worth checking out. After all, if you’re already ordering something like medication for your pet, adding a litter box could help you qualify for free shipping which will save you money. See if 1-800-Pet-Meds has the right litter box for your cat. This small pet store has been in business for nearly 50 years and has been selling their products online for over 20 years. Arcata Pet Supplies ships their products around the world. If you’re living in one of the 48 contiguous states, many of their products qualify for free shipping. While they have a limited number of litter boxes available, they do have competitive pricing that could make it worth visiting them. They also offer a variety of shipping options so you can get your cat’s new litter box as quickly as you need it. 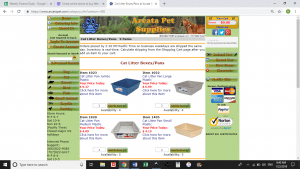 To support a small, US-based business, order your next cat litter box from Arcata Pet Supplies. Big Al has pet supplies for animals with four legs, two legs, and no legs. They also offer a lowest price guarantee, so you should be able to find some great deals on here. Even with a low-price guarantee, many of their products are discounted even more through sales. 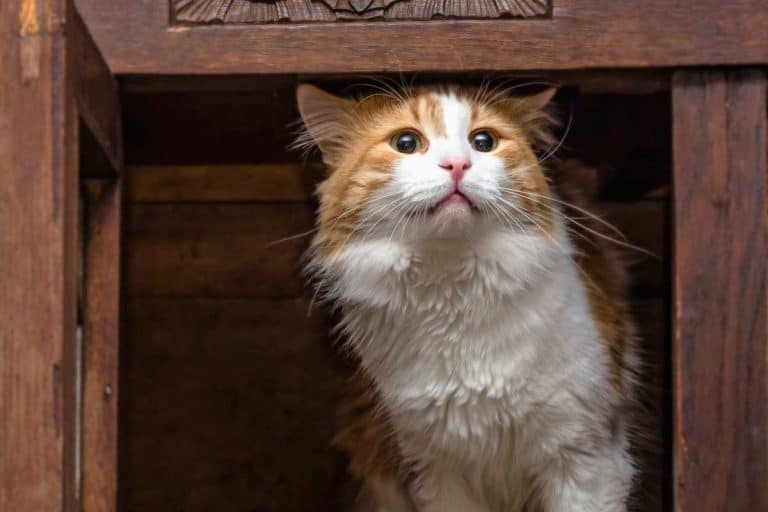 With several dozen litter boxes to choose from, there’s a good chance that you’ll find the right litter box for your cat here. 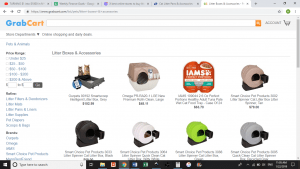 To avoid paying for shipping, you’ll have to stock up on pet supplies while you’re there, but there are plenty of things available for pets of all shapes and sizes. To get the best deal around on litter boxes and other pet supplies, check out Big Al’s Pets. This family-owned and operated store first opened their doors 30 years ago with a focus on providing specialty-items for dog show handlers. Eventually, they added more and more supplies until every type of pet was covered! They now have a descent selection of litter boxes and many other pet supplies to choose from. 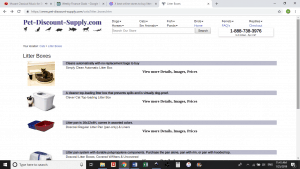 With large orders, you can qualify for free shipping, so it might be a good place to check out if you want to stock up on some cat food and litter while getting a new litter box. Care-a-lot Pets is certainly worth looking into when looking to buy a litter box online. This is another one of our favorite online stores to buy pet supplies. They offer food and other pet supplies from over 1,000 different brands, so you know they’ll have exactly what you need. This website operates entirely online and focuses on customer service for every pet owner that visits. When it comes to variety in the litter box department, they do not disappoint. They have dozens of options in several different styles so you can get the right one for you and your cat. Plus, they have 11 warehouse locations across the United States, ensuring fast delivery no matter where you are. Over all, Chewy is one of the best places to buy litter boxes online! If anyone knows what pet supplies are best for your fur babies, it’s two veterinarians. Dr. Foster and Dr. Smith opened a veterinary clinic together back in 1983 and have since taken their expertise online to help as many pet owners as possible have healthy pets. Their selection of litter boxes is unfortunately limited, but if they have something you like, then you may be in luck. With a low threshold for free shipping, it’s easy to qualify. While you’re there, be sure to check out their clearance section for additional savings. To see what litter boxes are recommended by a pair of veterinarians, visit Drs. Foster and Smith. 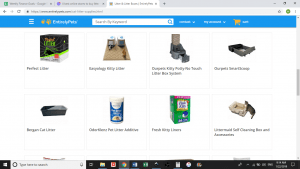 Another online-only pet supply company, Entirely Pets is another option for finding anything you might need for your pets, including litter boxes. 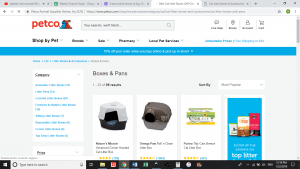 Because they frequently have sales, there are plenty of opportunities to save money while shopping online for pet supplies. When it comes to litter boxes, they have a few options to choose from. They also have a variety of other litter box accessories such as mats, liners, and deodorizers. Large orders qualify for free shipping, but their other shipping options are reasonable, too. 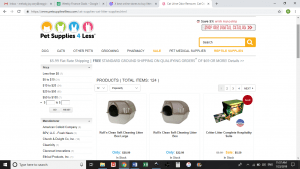 For all of your basic litter boxes and pet supplies, Entirely Pets is worth checking out. This family-owned pet supply company has over 10,000 high-quality products available. Their focus is on providing good customer service to pet owners along with a variety of pet products they’ll actually use for their pets. There’s a good variety of litter boxes along with other litter box supplies. Like others on this list, you can qualify for free shipping with a large enough order. If you’re also in need of specialty pet items, this is a website that may have it in stock for you. To support a small family business while purchasing your next litter box, consider buying from Got Pet Supplies. While not a pet-specific website, this site contains a number of pet supplies at reasonable prices. They also have everything else you could imagine, including clothing, sporting goods, kids’ toys, and jewelry. With their daily deals section, you can save some money. There are dozens of litter boxes to choose from, so you’re sure to find the one you want for your cat. 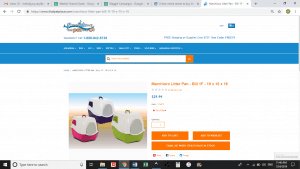 As one of their goals as a business is to provide the lowest prices, it’s certainly an online store worth looking into for buying a litter box. 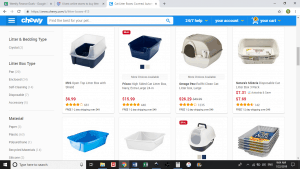 Check out Grab Cart if you want a good deal on a litter box and anything else you could want. This pet supply website focuses primarily on farm animals with sections for horses, cows, and pigs as well as companion animals. This could make it the ideal place for you to order your cat’s litter box if you have farm animals to buy for, too. 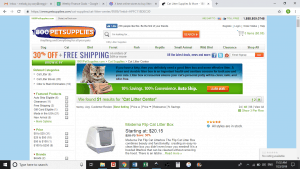 Unfortunately, the selection of litter boxes isn’t great because they don’t specialize in pets, but their prices are good and you can get free shipping on large enough orders. If you’re not too picky about your cat’s litter box, you should be fine getting one from here. Jeffers Pet has supplies for nearly every type of animal, so it may be a great place to pick up a litter box. This is another website that sells far more than just pet products. However, this can also be good news if you want to shop for other household items while looking at litter pans. Jet also has a lower threshold for free shipping compared to some of the sites on this list, making it easier to qualify. Unfortunately, they have less than 10 litter boxes listed so there isn’t much in terms of selection. However, their prices are competitive which could make it worth checking them out, especially if there are non-pet things you may want to buy on their site. With a limited selection and low prices, it won’t take long to decide if Jet is where your cat’s next litter box will come from. If you’re looking for a company that focuses on natural pet care, then this is the one for you. They offer high-quality pet supplies that are as natural as possible. For items you purchase often, you can save up to 15% by having it automatically shipped right to your door as often as you need it! Only Natural Pet has a limited selection of litter boxes, but that shouldn’t stop you from checking them out. After all, they may have just the litter pan you’re looking for, and they often have sales so you might be able to get a great deal on it. Check out Only Natural Pet to see what litter boxes they have and to see what other natural pet products they offer. 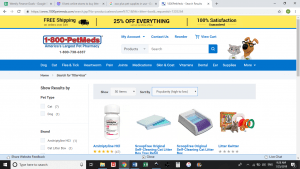 Half of this website is devoted to providing low-cost prescription medications for pets, but the other half has a wide variety of pet supplies for both dogs and cats, making it a good option for buying a litter box. They also have frequent sales to help you save money. 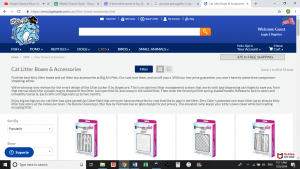 In addition to having a good selection of litter pans, Pet Care Rx also has other litter box accessories to choose from, including filters, litter mats, and liners. They also have some difficult-to-find specialty litters to help cats with specific conditions. To find the right litter and litter box for your cat, try looking at Pet Care Rx. It should be no surprise that one of the largest pet retail companies in the United States made it onto our list. 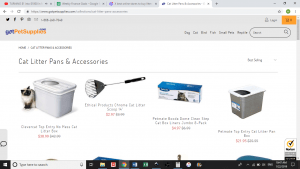 In addition to being able to buy a litter box in one of their numerous storefronts, you can also order whatever you need from them online. As you can imagine, Petco has an incredible selection of litter pans and other litter box accessories. They have nearly 100 different litter boxes to choose from, so we would be shocked if you didn’t find one that’s perfect for your cat. You can pick up a great deal on a litter box by getting it online from Petco. Like many of the websites on our list, Pet Discount Supplies offers a range of pet products for every type of animal. They even have sections dedicated to horses and ferrets. Their goal since the founding of their small brick-and-mortar store has been providing the highest quality of pet supplies. 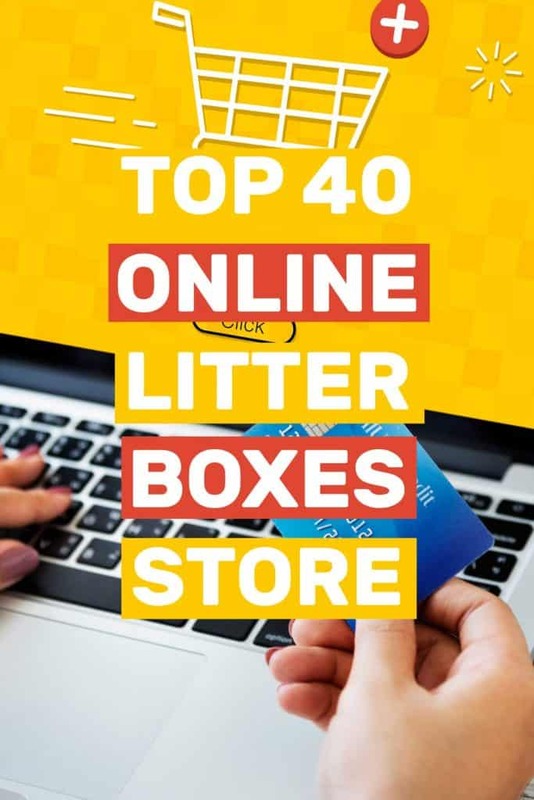 Also like many websites on this list, their selection of litter boxes is limited. They only have one of each type of litter box: automatic, open, covered, and top-entry. However, if you’re not too picky about the style, this might be the place to get your cat’s next litter box. Despite their limited selection, we recommend taking a look at what Pet Discount Supply has to offer. As their name implies, this website focuses on providing discounts to pet owners for a variety of supplies. 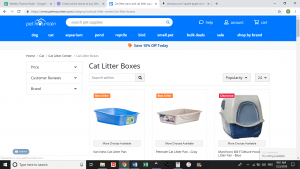 You can find amazing deals in their sale sections, so you may find yourself picking up a few extra things when looking for a litter box. Their selection of litter boxes is limited, but the prices are so good it’s more than worth it if they have the right litter box for you. 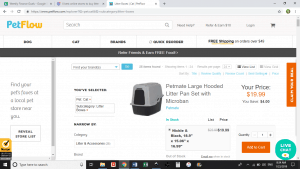 They also have other litter box accessories and other pet supplies, so you may want to stock up to qualify for their free shipping option. Pet Discounters is worth a glance because of their low prices even if their selection is limited. 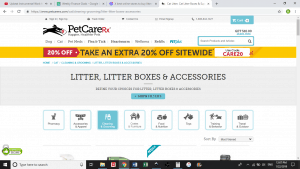 This website has pet supplies only for dogs and cats, which allows them to have an excellent selection of everything you may need for each of these pets. Part of their mission is to help animals, so they donate food to animal shelters for every item purchased online! 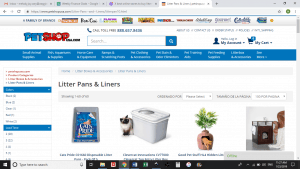 When looking for a litter box, this website should be a stop on your journey. They have a good selection available, and the prices are lower than some of the other websites on our list. We’re sure that you’ll like at least one of the litter pans they have. To help a pet in need while buying your cat’s next litter box, check out Pet Flow. The Pet Guys cover dogs, cats, small animals, birds, and aquarium-dwelling pets. For that reason, their selection is fairly limited for each sub-category. However, they also have low prices, especially in their sale section, so it may be worth looking into. As far as litter boxes go, they only have two listed at the time of this blog post. However, they’re also extremely inexpensive, so it may be just what you’re looking for. Just keep in mind the shipping cost, and you may want to stock up on other supplies to get free shipping. If all you need is a cheap simple cat litter box, the Pet Guys have you covered. At this online pet store, you’ll find a mountain of items available for every type of pet. They also have many items on sale or clearance so you can save money, plus a bulk section for supplies you want to stock up on. Their litter box section is full of a wide variety of pans to suit every cat owner’s needs. Many of these are on sale, so you might be able to get a good deal on a litter box. They have regular litter boxes, covered litter boxes, and some sifting litter boxes to choose from. For sales and clearance items, Pet Mountain has plenty of litter boxes for the frugal cat owner. This is another online pet website that has countless products across numerous brands for every type of pet. As such, it’s easy to find what you’re looking for, and maybe some things you didn’t know your cat needed! The litter section alone has nearly 3,000 products so you can get everything you need to take care of your cat’s bathroom area. In addition to litter boxes, they also sell litter, deodorizers, scoops, and litter mats. Be sure to also check out their “Offer Zone” to see what’s on sale right now. 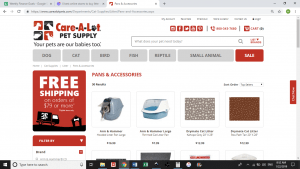 Picking out the supplies you need for your cat is easy on a site like Peto Cart that has more pet products than you thought existed! 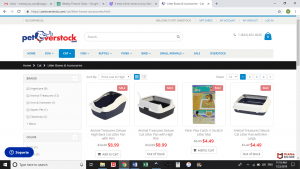 Most people have heard of Overstock.com. It’s a website that buys overstocked items at a low price and then passes those savings onto their customers. Well, Pet Overstock works the same way, but just with pet products! 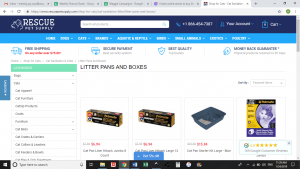 You can find a great selection of litter boxes here, but keep in mind that their availability and price change frequently depending on what the business can get ahold of. So, if you see something you like at a great price, we recommend stocking up on as many as you can. For low prices and an ever-changing stock of litter box options, be sure to check out Pet Overstock. Pet Sense wants you to do what makes the most sense when buying for your pets, which means buying high-quality items at a low price. So, they have a number of pet supplies to choose from that are all priced to help you save money. 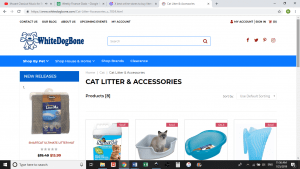 While their litter box section doesn’t have the largest list of products, there is a good enough variety that you should be able to find one for you. They have some biodegradable litter boxes, automatic litter boxes, and a number of regular open and hooded options. Be sure to take a look at Pet Sense to see if they have the right litter box for you. This is one of many websites owned and operated by UnbeatableSale.com. Their goal as a company is to provide their customers with the products they need and want at a highly discounted rate. Most of their products will save you 30 to 70% compared to retail prices. With dozens of litter boxes to choose from, their litter box section is full of options. We would be surprised if you didn’t find the perfect box for you and your cat. They also have numerous other pet products to look at if you have other things you need to buy. For hand-picked pet products at a fraction of retail cost, Pet Shop USA is the place to be. For smart pet owners, there’s Petsmart. 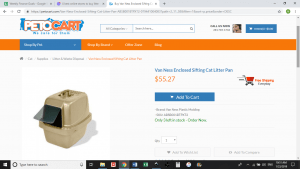 Of course it’s one of the first places you consider going to when looking to buy a new litter box, but you might do better ordering from their online store. For us, this is another one of our favorite online litter box stores. 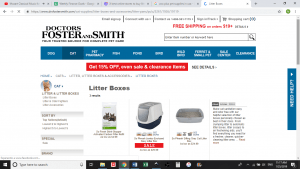 Petsmart has a number of litter box options to choose from in their online store. In fact, they have some that are only available online, so you won’t find those in stores. If you want to save even more money, you can order online, then pick up your new litter box from your closest store. If you want to save time and money, consider getting your cat’s new litter box from Petsmart’s website. 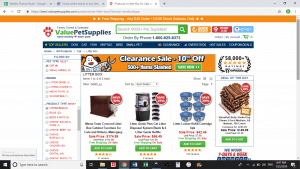 With over 40,000 pet products, Pet Store has something for every type of pet, including dogs and cats, small animals and reptiles, and fish and birds. They also offer same-day shipping so your order gets to you as soon as possible. Unfortunately, their litter box section is lacking at the time of this post. 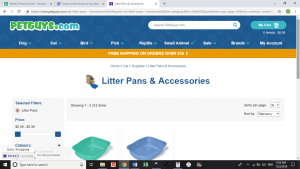 If you had other pet supplies you were buying and liked one of their offered litter pans, then it might work out well for you. However, if you’re picky about the litter box you get for your cat, you may need to look elsewhere. For fast shipping but with limited variety, take a glance at Pet Store. 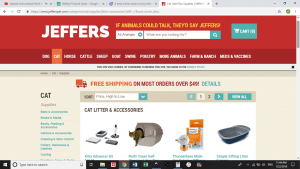 This website claims to have “Anything and Everything for Your Pet.” A quick glance at their list of pets which includes ferrets and wild birds makes us believe it just might be true. They also have a clearance section where you can look for some amazing deals on pet supplies. Their litter box section certainly does not disappoint. With a few dozen litter boxes to choose from and dozens of other litter box supplies, there’s something here for every household. Many of their litter boxes are also on sale so you can save some money by ordering from them. To get a great litter box and possibly something for your other pets, see what Pet Supplies has to offer. As you can likely guess by their name, this website offers low-cost pet supplies. They offer products for dogs, cats, birds, fish, reptiles, small animals, and large animals. If you sign up for their auto-ship option, you can save even more money. This is particularly great for cat litter. In terms of selection, they have dozens of litter boxes available, and in every imaginable style. 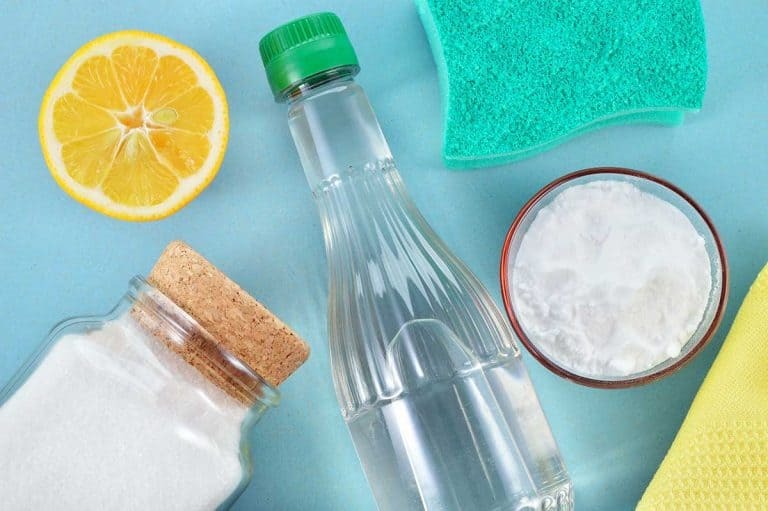 While their normal prices are already lower than some of the other stores on this list, they often have items on sale to help you save even more. For a cheap litter box and other pet supplies, there’s Pet Supplies 4 Less. This is another company that has several physical locations as well as an online selection. Their goal is to provide “Everything for your pet.” Since 1974, this business has been striving to do just that. If you live in New York, you may be able to visit one of their storefronts but otherwise can order a litter box online. Unfortunately, their online selection of litter boxes is extremely limited at the time of this post. However, if they are offering the type of litter box you want, then that won’t matter to you. And, if you need anything else for other pets, it might be a good time to get everything at once. 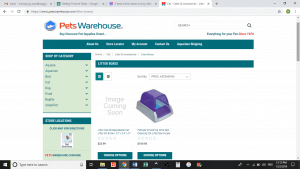 Take a look and see if Pets Warehouse has a litter box for you. This website finds great deals on products all over the web and then passes those savings onto you. You can find everything here for your home, hobbies, pets, and more. A quick glance at their long list of categories lets you know they have a little of everything available. 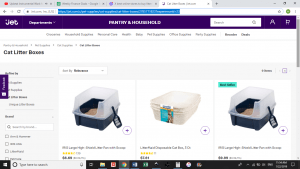 Unlike similar websites that have a smaller selection of litter boxes because of how many products they have, Pricefalls Marketplace has a great selection! They have dozens of litter boxes, and many of them are discounted from retail prices so you could save some money. 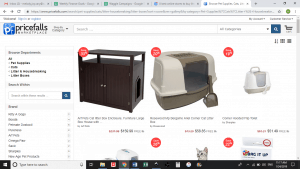 To shop for a new litter box and anything else you could need, be sure to check out Pricefalls Marketplace. Sometimes, the best way to get a good deal on a product is to buy it directly from the region where it’s made. 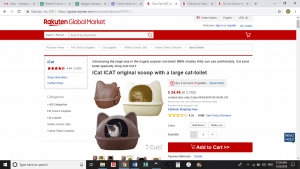 With Rakuten Global Market, you can search through Japanese stores online to find unique items in a wide variety of categories which includes pets. While their selection is limited, it’s also unique, so you might be able to get your cat a fun litter box that none of his friends have. Something else you do have to check before finalizing your order is shipping, as this can be costly. 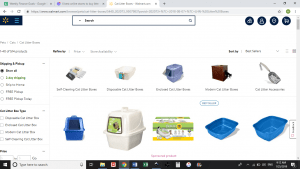 If you don’t mind paying for shipping for a one-of-a-kind litter box for your cat, see what Rakuten Global Market has available. While you may not think of chickens, monkeys, or bees when you think of pets, Rescue Pet Supply does. They make sure they have supplies for the regular list of dogs, cats, birds, reptiles, and small animals as well as a number of exotic ones. Their list of litter boxes for cats is limited primarily to simple ones. However, they do keep their prices down so it may be worth it for you to get one from them, especially if you have some unusual pets that you need to order supplies for, too. With products for animals that most people wouldn’t even consider a pet, Rescue Pet Supply covers the needs of every pet owner. 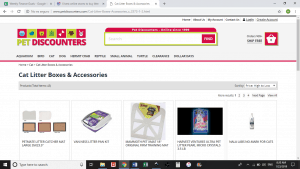 They may have started off exclusively selling fish and aquarium supplies, but this company has since expanded to include a number of other types of pets. If you visit their store in Lancaster, PA, you’ll find over 700 aquariums. That Pet Place’s litter box selection isn’t nearly as expansive as their fish section, but they still have a descent selection to choose from. They also have good prices on most of them, so it’s definitely worth checking out to see if they have the style you like in stock. Be sure to swing by That Pet Place to look for a new litter box, and to satisfy your curiosity about the fish they carry. As you probably already know, Target is a large retailer with numerous stores across the United States, nearly 2,000 to be more exact. 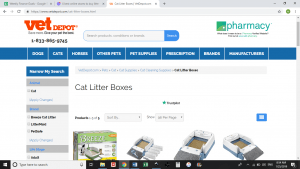 If you don’t have a store near you or want to avoid the temptation to look around, you may want to buy a litter box from them online. Because they don’t specialize in pet supplies, Target doesn’t have the best selection of litter boxes. However, there are still enough styles and colors that anyone should be able to find the best litter box for their situation. 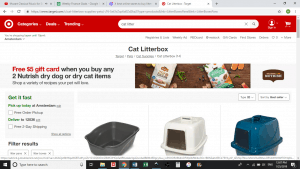 Take a look at the litter boxes Target has to offer in their online store to see if one is right for you. You can find Tractor Supply Company stores in rural areas all over the United States. If you don’t have one near you, you can order from them online. They primarily carry products for farming and farm animals, but that certainly includes cats. They have a good variety of litter boxes at reasonable prices. Their shipping rates are reasonable as well. If you’re considering using something like wood pellets for litter, this is a great place to buy it in bulk and save money, so you may want to do all of your cat’s litter shopping here. For litter boxes and anything else you could want for a farm, Tractor Supply Company is the way to go. 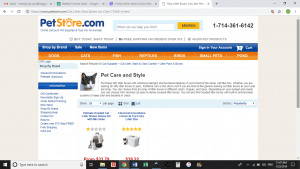 This pet supply website has supplies for every category of pet, including dogs, cats, birds, reptiles, and small animals. This family-owned and operated company has over 9,000 products for sale, many of which are offered at discounted rates. 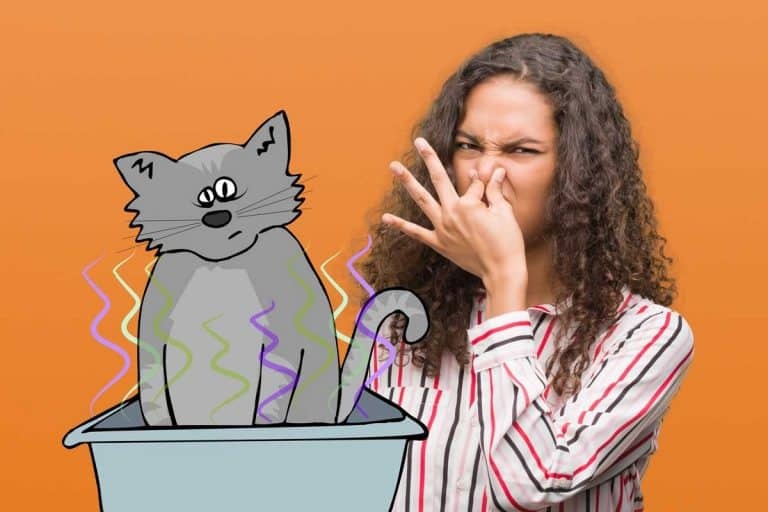 Unfortunately, their litter box selection is lacking, but if they have the type of litter box you’re looking for, it may still work out best for you. Since they also have a huge number of other pet products, you may want to shop around to qualify for free shipping. To get a great deal on limited variety of litter boxes, check out Value Pet Supplies. Although Vet Depot specializes in over-the-counter and prescription medications for pets, they also have a great selection of pet products for sale. They primarily cover dogs, cats, and horses, but birds, small animals, and other livestock are also covered. Because they focus on medications, the litter box section doesn’t offer much in terms of variety, but it does offer some savings. You may find that it’s worth it to order a litter box here, as long as you get lucky and like what they have. Be sure to check out the deals at Vet Depot, even though they only have a few litter boxes to choose from. Did you know it was possible to help animals while buying your cat’s next litter box? By ordering pet products through WagStar, you can! They’re committed to helping animals which is why they give back to a number of animal charities every month. 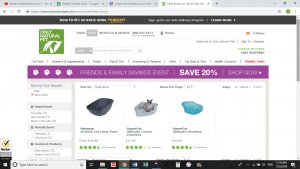 While their litter box section is limited, they do have some great deals on what they do have when compared to other websites. That makes them worth looking into, especially when you consider they have other pet supplies you can buy, and that you’re helping animals with your purchase. 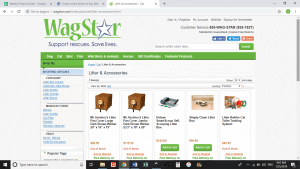 Take a quick glance at what WagStar has to offer and see if they have the perfect litter box for your cat. With over 6,000 stores in operation, Walmart should need no introduction. This company has been committed to offering a massive variety of items at low prices since 1962. You can find nearly anything you want in their physical stores, or place an order online. While their selection of litter boxes varies by store, their online selection is incredible. We have no doubt that you’ll be able to find the perfect litter box for your cat. Furthermore, their prices are on the low end, so you know you’re getting a good deal on them. 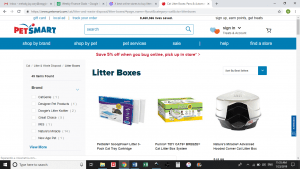 Another one of our favorite places to buy a litter box online, be sure to see everything that Walmart has to offer! As you can imagine, this website focuses on canines, but they still have some products available for cats and birds as well. One thing that sets this company apart is that they only source products from the United States to help support people in their own country. 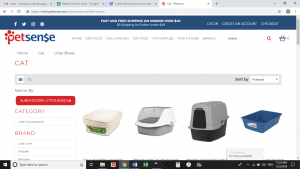 Their litter box section doesn’t have a lot of options, but everything available was made in the United States so you don’t have to worry about lead or other concerns that come with foreign-sourced products. While you’re there, check out their clearance section. White Dog Bone may not have a wide selection of litter boxes, but at least you know they’re high-quality and come directly from right here in the United States.